In A Dockyard Apprentice’s Story, Robert Smith (‘Nige’ to his mates) told of his formative years as a young trainee in Chatham Dockyard, where he trained as an engine fitter and turner. 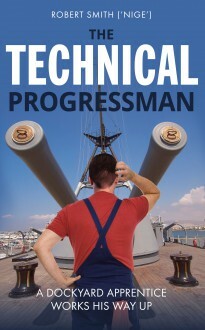 The Technical Progressman is set in the 1960s, taking up the story from the point where Bob transfers to the Weapons Section as a Technical Progressman. It is the second part of a trilogy covering the whole of Robert’s working life with the Ministry of Defence. Far from being a dry catalogue of working experiences, the story is packed with amusing and offbeat anecdotes – as befits a young man growing up in the decade of pop groups, mini skirts and flower power.